Lobster Roll kit for 4! Home > Lobster Meat > Lobster Roll Kits! > Lobster Roll kit for 4! So good, you'll think you're sitting seaside on the coast! Our Lobster Roll Kits bring the taste of Maine right into your own home! That's right, make your own Lobster Salad Rolls right in your own kitchen! We ship you enough for 4 big homemade lobster rolls! So good, you'll think you're sitting seaside on the coast! 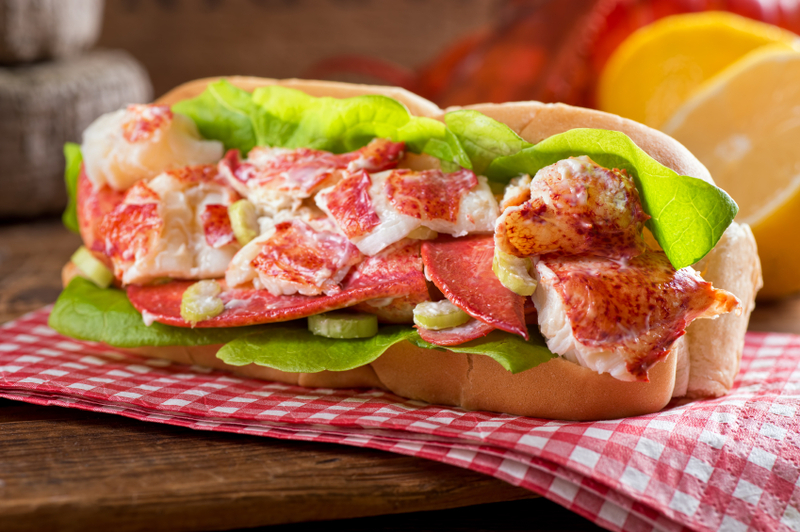 Our Lobster Roll Kits bring the taste of Maine right into your own home! This is a great gift idea! Includes: 1 lb. Frozen Premium Lobster Meat, New England Style Rolls, Hellmann's Mayo, and fresh Celery! Order Our Maine Lobster Roll Kits Anytime Online, OR By 10am EST For Next Day Delivery And Enjoy Them For Dinner Tomorrow! Maine Lobeter Roll Kits Also Makes A Great Gift Idea For Your Favorite Seafood Lover! How Easy Is That! My husband has never eaten "real" lobster as he had a shellfish allergy for many years, so I thought I'd surprise him with lobster rolls for supper last week. I actually let him have a taste of both tail meat and claw meat with melted butter. He didn't know anything could taste as good as that! Then, I made the rolls and he decided this needs to be a regular item on our grocery list. Wonderful service, easy ordering, and fast shipping. Great job! My son in Maine purchased for me for Fathers Day your lobster roll for four. I am so pleased with the packaging of the lobster with the rolls, celery and mayonnaise, and best of all the delicious taste of the lobster. I am impressed! I wanted you to know how much we enjoyed this great Fathers Day present. Ordered this instead of the live lobster and it was great! I was debating whether I wanted order live lobster, but it seems inhumane to get put the lobster in a dark box only to pull it out and eat it. LOL. So I figured it might be more humane to spare it the flight to D.C. and the lobster meat for the rolls were wonderful without any smell. It was delivered frozen, but a quick water bath for 20 minutes helped thaw it out nicely. I mixed in the mayo and celery and added my own onions and salt and pepper. The instructions said to refrigerate for an hour which we did- and it was delicious! We also paired it with clam chowder and the smoked salmon dip for a delicious Valentine's Day meal without any cooking! This order has inspired me to see to what other scrumptious treats I can get shipped online! We recently ordered 2 lobsters, 4 lobster rolls and 2 clam chowders however, due to a problem with Fed-ex our order was delayed. The extra effort made by Christie got the order to us one day after the expected delivery date and fortunately our lobsters survived the delay. We are VERY impressed with the excellent communication throughout this process.you should be very proud to have folks like Christie working for you. We have ordered from The Lobster Guy many times in the past with never a glitch and you can be sure we will continue to support you and well tell our friends. Got this kit for Labor Day. Excellent meat, we had 4 tails and 3 claws of picked sweet meat. I think it's also cute that they also uncle celery and mayo. Would love to order it every week! I ordered this kit for my Mom for Mother's Day. My parents used to live in Maine & my Mom recently commented how much she missed the lobster rolls. The kit was delivered right on time. My Mom said the packing & presentation were nicely done and the lobster rolls were delicious. She was surprised and thrilled with the tasty & creative gift! Got this as a gift. It was enough meat to make 2 massive stuff rolls...and meat leftover. It was great. We ordered first time form the lobsterguy, and it will not be the last. As promised, they were excellent! Where do you gret those buns? Really good stuff! We will order again for the holidays. This is a great Gift! My Mom loved it! She said it was really good, keeps talking about it.